If you’ve never participated in a Motor Tour, you may not know what we’re talking about here. In case you’re wondering, read, What is a Motor Tour Anyway? to get up to speed. Our annual Motor Tour for 2019 is shaping up nicely: this year’s theme is Life in the Slow Lane! You can now pre-register for this fun-filled weekend event. This year marks our 30th Motor Tour. You get a lot of fun for only $35 per registered car! You don’t need to be a member of our association to participate in our Motor Tour, but we’d love it if you joined our mission to Preserve, Educate, Promote and Enjoy Route 66 in Illinois. Click for membership information. Registration: (fill out registration form and pay on site OR pick up participation packet if pre-registered) Friday evening June 7 – 5:00 PM -8:00 PM OR Saturday morning 7:00 AM – 8:30 AM at White Fence Farm (parking lot), Romeoville, IL. (Tour takes off immediately following morning registration). 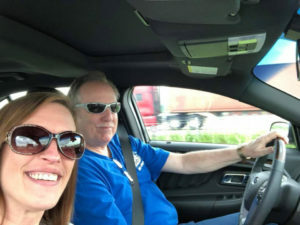 Includes stops/events in Joliet, Gardner, Atlanta on Saturday; Springfield, Nilwood and Gillespie (special event) on Saturday and many more destinations along the way! Hall of Fame Banquet (separate event – $25 per person) Saturday evening will be held at the American Legion Hall in Lincoln, Illinois featuring the famous food of Chef Wentlandt! Click for official registration form which includes additional Motor Tour details. Pre-registered tour participants will receive further details at a date closer to the tour date by mail. We look forward to motor touring with you! The Road Ahead Partnership is looking out for the future of Route 66. The annual meeting of their Board of Directors was held on February 22 and 23 in Albuquerque, New Mexico. Read the official press release of the results and findings of that meeting in this report. We are sorry to report that Dee Pincsak passed away the afternoon of Sunday, February 17. Ever involved in Route 66 activities, here’s Dee arriving at one of our Association picnics. Dee and her husband Gene are At-Large Board members of our Association. A memorial service will be held at a future date. Updated details: The visitation will be this Saturday, February 23, from 12:00 noon – 2:00 PM at the Jackson Funeral Chapel, located at 250 N. McKinley Ave in Rensselaer, Indiana. A funeral service will follow at 2:00 PM. Dee’s obituary can be viewed on the Jackson Funeral Chapel website. This year just flew by! In reflecting with fellow members, we talked about how much we accomplished this year, what we have yet to do in Illinois, and what we hope to work on next year. “Next year” is here already! As I write my President’s letter update, we are in the midst of a government shutdown. 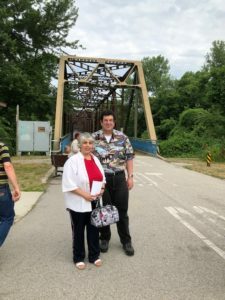 The National Trail is currently stuck but I believe that this Bill making Route 66 a National Trail is a necessity – it must pass! Our Association is full of sincere, enthusiastic caretakers of the Illinois miles, but as the road ages, so do we. There’s a time and place for government in our lives and I believe National Trail status will ensure that the grit and self-reliance of the Mother Road will continue on and be protected as a National Trail. Since 1989, our Association has worked with IDOT on making sure all the alignments in Illinois were marked wherever possible. Since there were business routes and temporary detours, not all 66 alignments are recognized by their communities. We have seen in the past few years Lincoln marking all three alignments that run through their city, and we are hoping Springfield will add signage to a few sections of their 66 alignments as well. There was a couple that did Route 66 and realized while they were traveling back to New York that they missed the Turkey Tracks. So they drove back. Never underestimated the two-lane and its stories. 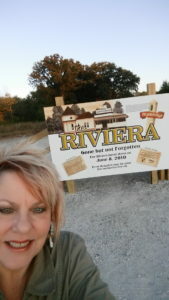 Our Association participated in the recent Sonrise Donut Sign auction, It is our stance that we don not buy icons or signs, l however we were worried that this sign would end up leaving Illinois and become part of a private collection in California. John Lucchesi, our Sangamon County representative, filled us in on what was going on and our Executive Committee participated in an open discussion of what we should do. The bidding was fast and furious and our bids were quickly outbid. It turns out that a group of Springfield business members had put together funds and were working on a plan to save the sign. The City also revealed that they will be working on more 66 signage for the city of Springfield. I told him that my Christmas wish was that the Sonrise Donut sign would stay in Springfield. That’s when he told me that Springfield had rallied and had put together the funds to buy the sign (both sides). We lost a past board member, Wyman “Bill” Deck since our last newsletter. 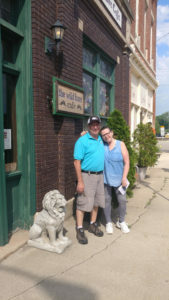 Bill was always an interesting conversation, fully engaged with preserving not only his family’s pharmacy history, but the history of Girard and the other Blue Carpet corridor communities as well. Bull will be missed. Luckily, the Route 66 Scenic Byway was able to record some oral histories with him before his passing. Our 2019 Motor Tour theme will be “Life in the Slow Lane.” We look forward to a north to south tour this year, with our overnight in Lincoln. We already have some amazing new places to stop as well as some tried and true. This will be our 29th tour. Save the date – the first full weekend in June 2019 – the 7th, 8th and 9th. So until the rain stops and the snow flies, we look forward to a new year of preservation and festivals on the road. I ask that you support the local small businesses that service the 91 communities of Route 66 in Illinois. Our latest joint effort with the Route 66 Association of Missouri will be the relighting of the original neon window signs at the Ariston Cafe in Litchfield. We look forward to the “new” “old” neon in the Ariston’s windows. 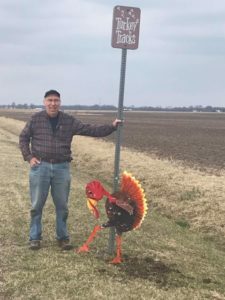 Our past joint efforts include the Luna Cafe, the Vic Suhling sign at the Litchfield Route 66 Welcome Center, and the Del Rhea Chicken Basket sign in Willowbrook. There is nothing as inviting as a warm original neon sign. We appreciate the hard work of our county reps. In the last year, we’ve had some personnel changes, and we’d like to acknowledge the time and effort of these county representatives for their years of service. Jerry Law, “The Emperor of the South.” was amazingly hands-on in the counties from Springfield to the Chain of Rocks bridge. Jerry’s enthusiasm and friendly smile endeared him to many along the road. Don Johnsen, DuPage County rep, brought his amazing energy to our meetings with fresh perspectives and events. 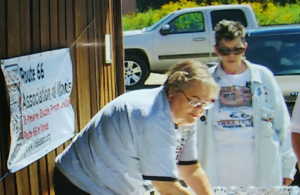 Martha Jackson, a constant in the Litchfield community, is sidelined by her health but continues to represent Route 66 in the Litchfield area. 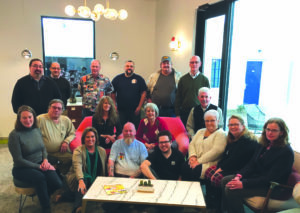 We appreciate the efforts of all our county representatives, past and present, for giving up their time for meetings and volunteering at the Route 66 Hall of Fame and Museum. The current Board looks forward to a new year and new projects along the Illinois miles. On behalf of the Board of Directors of the Route 66 Association of Illinois, I wish you all a happy, health, prosperous New year! May your photos and warm memories of your ’66 trips make the winter days fly.